Botrytis blight on rose flowers. The pathogen is not host specific; it can attack almost any flowering tree and shrub. Some trees and shrubs that are susceptible are alder, apple, apricot, ash, azalea, barberry, cherry, Douglas fir, flowering almond, hawthorn, holy, honeysuckle, hydrangea, larch, lilac, magnolia, mockorange, peach, pear, persimmon, plum, rhododendron, tree-of-Heaven, and viburnum. Botrytis often lives on dead plant material and from there, spread into weakened living plant material. It can also infect through wounds or healthy tissue without going though dead or dying tissue. This fungus disease can cause twig blights on stems, buds, flowers, fruit and leaves; can be confused with other diseases that cause similar damage. It can cause gummosis, fruit rot and damping off. When humidity is high a thin to thick web of mycelium develops on diseased tissue. This mycelium is grayish in color, hence the name gray mold. Symptoms may vary depending on the plants attacked, plant parts attacked, and growing conditions. Botrytis is sometimes confused with old age and thrips damage. To help separate browning on petals caused by old age versus botrytis, check the petals closely. Browning from old age should occur on the outer petals first and along the edges or at the tip of the petals. When inner petals or the middle of the petals develop brown lesions first, gray mold is probably the reason. On leaves that are relatively thin such as redbud, lesions are light brown to brown and irregular. On fleshier leaves such as rhododendrons, concentric rings of different shades of brown may be visible. Botrytis can overwinter on both live and dead plant tissue. On dead plant material, the pathogen can over winter as mycelium (fungal growth). Botrytis does not need to attack living plant material since it can live on dead plant material very well as a saprophytic fungus. Spores spread from infected tissue to non-infected tissue via wind and water. Spores are released with rapidly decreasing or rising humidity levels as well as rain drops hitting the spore structures. Under the right conditions, any disturbance of the air around the spore structures can cause hundreds of thousands of spores to be released. Botrytis is active from 32 to about 84 F. The pathogen needs moisture as one of its criteria for infection. The wetter the plant is, the more likley the gray mold will show up on plants. Cool temperatures may slow the disease down but as long as it is moist the disease continues to infect and spread. Hot dry weather can shut the disease down. There are no known resistant plants. Control of this disease is to control the environment. Keep plants healthy by avoiding any stresses such as plants staying too wet or too dry, chemical or mechanical injury, and too little or too much fertilizer. Improve air circulation and sunlight. Avoid over head watering. Especially keep open flowers with many petals dry. There are some fungicides to help prevent or reduce leaf, fruit and stem infections. Sanitation may be helpful, but is not perfect since the disease can blow in from a long distance. 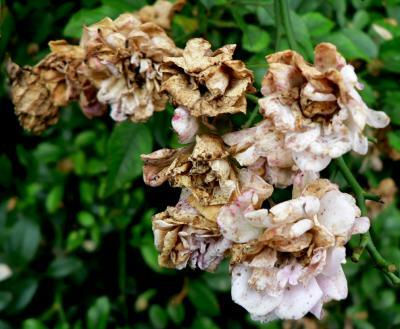 Dead head dying flowers and remove all infected plant tissue. Burning is the desired method of destroying infected tissue. However, burning is banned in most urban areas. Therefore, infected plant material may be buried. Cover the Botrytis-infected plant material with at least a foot of soil.